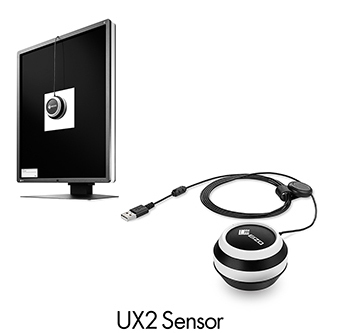 Hakusan, Japan, April 6, 2017 – EIZO Corporation (TSE: 6737) today announced the release of the UX2 Sensor, an external calibration sensor for medical monitor use. It is the successor model to the UX1 Sensor and is developed and produced by EIZO. The UX2 Sensor uses the same technology as the calibration sensors built-in to select RadiForce medical monitors. It features improved humidity and impact resistance compared to other sensors and comes with a protective cap to prevent the sensor from becoming dirty and being affected by moisture during storage. The UX2 Sensor also features a new user-friendly LED indicator. The indicator, which surrounds the device, lights up when it has been correctly connected to the monitor to ensure efficient calibration. Furthermore the design, featuring a white band on the black body, was created to match the aesthetic of EIZO’s range of RadiForce medical monitors to promote a feeling of sophistication and cleanliness. The UX2 Sensor is compliant with several countries’ quality control standards such as JESRA (Japan), AAPM (USA) and DIN (Germany), when used in conjunction with EIZO’s RadiCS quality control software. As a result, users can make accurate measurements and calibrations according to medical grade qualifications. The UX2 Sensor will begin shipping in August. Date of availability varies by country so contact the EIZO group company or distributor in your country for details. All product names are trademarks or registered trademarks of their respective companies. EIZO, RadiForce and RadiCS are registered trademarks of EIZO Corporation.